2 Ajaw 3 Wo (April 24, 2016): One winal to go! 2 Ajaw 3 Wo. Drawing by Jorge Pérez de Lara. 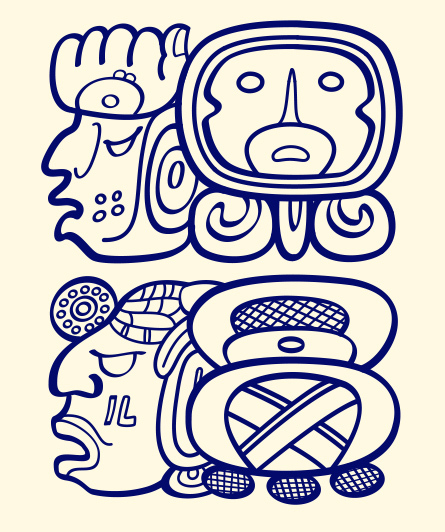 For any of our readers who might possibly not know what a winal is, it is a twenty-day period in the Maya calendar. You may have noticed that all our blogs occur on the day Ajaw, the twentieth day of a cycle of twenty days (the “j” in Ajaw is pronounced as in Spanish, with an “h” sound, so Ajaw sounds like “a how” as in “how are you?”) Today’s blog, on 2 Ajaw, is twenty days before the end of our fund-raising drive, which also marks the opening day of the Third International Congress of Maya Epigraphers, on 9 Ajaw. 8 Ajaw 3 Pop. Drawing by Jorge Pérez de Lara. For today’s blog, at the half-way mark in our 80-day campaign, we hear directly from one of the congress organizers, Ajpub’ García (pictured in red, below). Advanced team at 2012 Valladolid congress, from left to right: Waykan Benito, Maya Poqomam; Ajpub’ García, Maya Ts’utujiil; Clement Peneleu, Maya Ts’utujiil; Hector Xol, Maya Q’eqchi’; Antonio Cuxil (hands on table, lower left), Maya Kaqchikel. 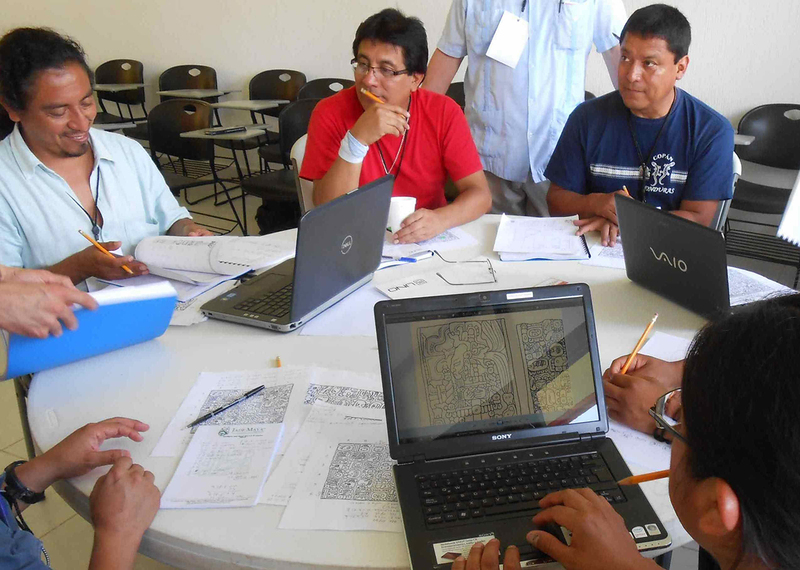 We continue on the saq b’e (resplendent road), learning and reclaiming the ancient Maya writing. Our ancestral writing, calendar, and astronomy have much yet to be discovered by our sons and daughters, grandsons and granddaughters. We need to recapture this knowledge now so we can pass it on to future generations. 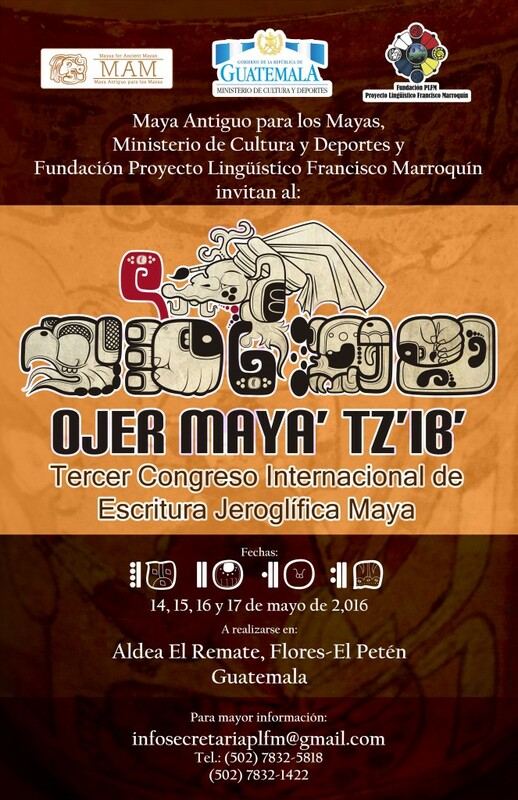 To this end, we are organizing the Third International Congress of Ojer Maya Tz’ib’ (Ancient Maya Writing). If there is any possibility, we need your support, dear friends, to make this event a reality, no matter how much you can donate. 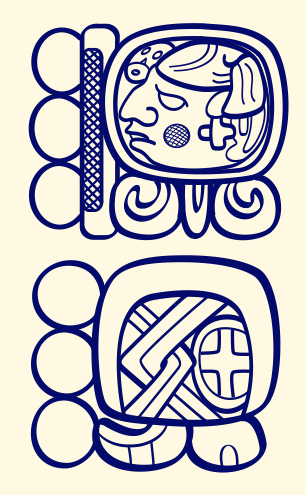 Today we tap on your door for the sake of Ojer Maya Tz’ib (Ancient Maya Writing), that it may follow its path in the four cardinal directions.